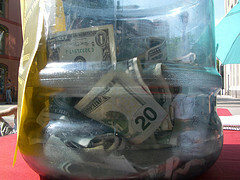 Friends of Olympia Farmers Market really appreciates your kind contributions. Please use the PayPal button below to make your donation today. Please also consider becoming a sustainable member by using an automatic monthly contribution. In addition to cash contributions, a contribution of appreciated assets to a public charity can have great tax benefits. We also provide you with the opportunity to honor someone special, with the purchase of Personalized Paving Bricks (Small & Large). If you are an Amazon shopper please use this link and Amazon will donate a portion of every purchase to us. Please tell your friends!